If you're still having Directmusic MIDI timing problems with Cubase SX or Nuendo, try testing your MIDI interface with Jay Levitt's MIDItime utility, which works out the best setting for Steinberg's Directmusic 'Use system timestamp' tick box. Here you can see that my two PC system clocks had only drifted apart by a tiny 5ms or so after almost 10 minutes. I can live with that! Despite Steinberg's efforts to solve them, MIDI timing problems are still plaguing a few Cubase SX and Nuendo users. The most common issue still seems to be with the emulated Directmusic MIDI ports I discussed back in PC Notes September 2003. Using these can cause notes to be recorded late or early, or several notes to be clumped together, or notes to be missed. In addition, if the emulated ports are active at the same time as the 'real' drivers, doubled or even tripled notes can result. In Cubase SX 3.01, Steinberg revamped their MIDI port filter to choose native Directmusic drivers if available and standard Windows MME ones if not, avoiding emulated drivers. Manual configuration should no longer be necessary in most cases, and anyone updating should move the 'ignoreportfilter' file back into the 'midi port enabler' folder. To give you the background, Steinberg have always been keen for us to use the Directmusic MIDI drivers because they time-stamp incoming data, so if your PC experiences any delays when recording notes during a live MIDI performance it still knows exactly when they were originally received and can place them exactly where they should be in your MIDI track. Unfortunately, Windows provides two different high-resolution timers, and MIDI Interface drivers may rely on one or the other for their timing. 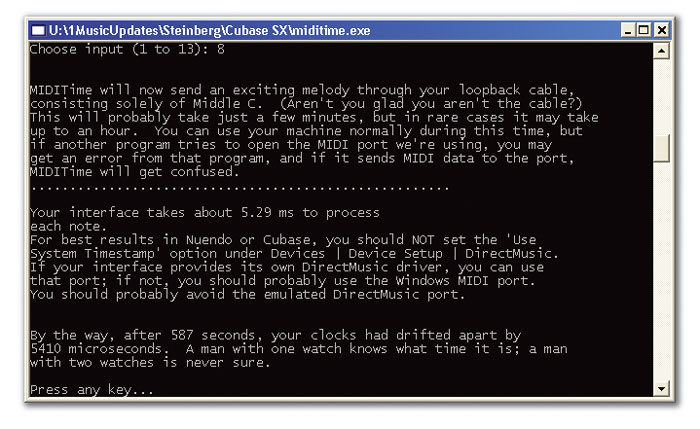 The clock normally used by Cubase SX and Nuendo is supposedly TGT (TimeGetTime), which also tends to be the one used by older MIDI devices with their standard Windows MIDI drivers. So far so good. However, from Cubase SX v2.3 onwards Steinberg offered a new 'Use system timestamp' tick box in the Directmusic page of Device Setup, and this has confused the situation. You should ideally tick that box if you have persistent timing problems with real or emulated Directmusic drivers, to switch to a different and potentially more accurate timing reference that uses QPC (Query Performance Counter). However, some motherboards (particularly those supporting two processors) have inaccuracy and drifting problems with this clock. So if your MIDI interface provides true Directmusic drivers (as does, for example, Steinberg's own Midex range), how do you know the best setting to use with your PC system? To the rescue comes Jay Levitt with his MIDITime utility. This utility runs both timers while sending data via a loopback cable from a MIDI output to an input, and then reports at the end of the test which timer was the more accurate, so you know which to choose with Directmusic drivers. On his web page (www.jay.fm/blog/pc-midi-timing-and-nuendo.html) Jay has already collated the results for various makes and models of interfaces, as well as a small selection of motherboards that don't seem to suffer from clock drift and can therefore be used with either setting. Unfortunately, some musicians still have timing problems that result in their MIDI recordings being 'pushed back' slightly with Cubase SX3 when they're using external hardware MIDI synths. This 'early MIDI' problem, as it has become known, doesn't seem to respond to any of the available Steinberg tweaks. When I can find out more on possible solutions, I'll report back. There's another issue that you may need to bear in mind regarding Directmusic drivers. Evert van der Poll of MIDITest fame (http://miditest.earthvegaconnection.com) has found in his tests that most Directmusic drivers can't record MIDI SysEx dumps from hardware synths. So if you need to insert patch data into your MIDI tracks, switching to standard Windows MIDI drivers seems the only option. In PC Notes February 2005 I discussed the various improvements offered by Gigastudio 3.03, as well as providing some hints and tips for getting the best out of it. I don't normally return to the same topic so quickly, but I know many users of the previous version 2.5 are still hanging back from updating, and since various significant problems have now been ironed out in version 3.04, and I've found workarounds for a few new ones as well, it's worth revisiting. First up, I'm very pleased to report that with version 3.04 I can finally run my Pentium 4C 2.8GHz PC with Hyperthreading enabled. This means I can take advantage of a lower CPU overhead at soundcard latencies under 12ms with Cubase, as well as a more responsive user interface with many applications, even under a heavy CPU load, and achieve greater Gigastudio polyphony as well. I'm pleased to see these further HT compatibility improvements, especially as they now also mean that dual-processor machines are supported. Compatibility problems with Powercore cards were cured in 3.03, and 3.04 also improves compatibility with Universal Audio's UAD1 card, so the only remaining hardware incompatibility of any note is with 64-bit processors, which isn't a major problem just yet for the majority of users. Other benefits of downloading the free 17MB GS 3.04 update include faster Quicksound searches, further improvements to MIDI mute behaviour, and cures for a couple of dozen bugs (a full list is available in the PDF 'Change History' document). I'm pleased to note that the install problems I experienced with the program should also be a thing of the past, as the 'Install Content Only' option now works even after running application updates. The only downside is that two more third-party software applications have, unfortunately, been added to the list of those that cannot be installed on the same computer as Gigastudio 3. Ahead's Nero InCD probably won't worry too many users, but it's a shame that Cakewalk's Project 5 causes problems. I've experienced a few new problems relating to Gigastudio 3, but I've found workarounds that may help others who come across the same problems. First up, I recently launched Cubase SX3, created a new MIDI project, chose a VST Instrument, and then went to the first Cubase MIDI track to choose it as an output. Nothing happened for several seconds, and then up popped a vast list containing 120 MIDI options, 112 of them being each and every MIDI channel for seven MIDI ports relating to Gigastudio 3.0 Orchestra. I discovered several other people posting on GS-related forums about this issue, and I eventually tracked it down to Rewire 2. As soon as I disabled Rewire support in Gigastudio (which wasn't even running at the time) the unwanted 112 ports disappeared from my list of possible MIDI outputs in Cubase SX. I've since contacted Steinberg and Tascam, and Steinberg told me that there's currently no way to hide Rewire MIDI ports inside Cubase SX, as you can Windows and Directmusic ones, while Tascam duly logged the details and passed them onto the GS development team. Perhaps they'll provide control over the number of Rewire MIDI ports within GS3 in a future version. In the meantime I've suspended using the Rewire function. My second frustration was a GS channel whose output suddenly disappeared altogether. It took me 10 minutes of head-scratching before I finally tracked down Gigapulse Pro as the culprit. I was using it 100 percent wet, and for some reason the convolution reverb output had stopped altogether. If this happens to you, save your current Gigapulse Pro settings as a preset, load a different Gigapulse reverb, then reload your preset to restore the original settings. I had a similar problem with the output from Gigastudio 's NFX2 chorus/flanger plug-in occasionally going slightly distorted, as if its sample rate had dropped to about 8kHz. The cure is to save the current NFX2 settings as a new preset, load in any other preset to return the audio to its former pristine state, then reload the new preset to return to the original settings. The word prolific might have been coined to describe xoxos (www.xoxos.net), an Arizona, USA-based musician who has managed to create more than 50 VST Instruments and effect plug-ins for PC musicians, the vast majority of which are freeware or donationware, using the famous Synthedit (see my review in SOS July 2004). You can download five modelled VST Instruments — Brass, Bowed, Plucked, Synger (voice synthesizer), and Xotica (vibraphone) — plus a fascinating series of nine algorithmic compositional tools triggered by a single MIDI note of the desired duration, and with gate and pitch events determined using probability functions. Fancy a non-stop pop music generator with synthetic voice accompaniment? Breath Cube is a freeware download by xoxos that really does produce random songs that are interesting to listen to, and different every time.The selection of six percussion synthesizers is slightly more traditional, but the nine other synths range through analogue and FM to experimental designs incorporating the 17-tone Pythagorean scale, and there are also two samplers and 14 effects, including unusual options such as the Smoky Joe formant shifter; the Resonator, designed to add acoustic body resonances to bland instrument sounds; and Gum, which incorporates three sample-and-hold buffers driven from a 16-step sequencer. The shareware MIDI Pack costs just $5, and contains arp2midi (an arpeggiator that can also have its output converted to MIDI controller information to automate any VSTi parameter), and q2midi, which generates complex algorithmically-determined sequences in an assigned key and tempo, using probability functions to determine notes, velocities and rests. 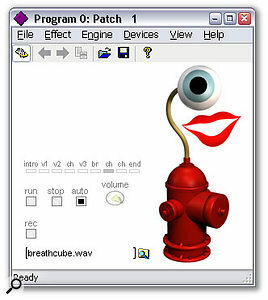 Possibly the most intriguing xoxos creation to date is the latest one: the stand-alone Breath Cube consists of a pop-music generating engine plus a three-band synthetic voice to 'challenge your listening skills' (download from www.atomictraveller.com). It can play tunes with an intro, verses, choruses, a bridge and an ending that are different every time, and it's even possible to capture the output as a WAV file and save it for posterity. Although the program is freeware, a donation of $10 is suggested for wealthy people who enjoy it. You can also download some xoxos music at www.dancetech.com/~xoxos. Whenever does he find the time to sleep?